As more and more people build dedicated home theaters, some are “thinking outside the box” and taking their home theaters outside. For some, watching movies outdoors evokes the magic of classic drive-in movie theaters. For others, the romanticism, mystery and thrill of their favorite film is enhanced by the beauty and ambiance of an outdoor setting. Whatever your reason, an outdoor home theater is a great way to host memorable movie nights, and with today’s technology, climate is no longer a factor. The only limits are imagination and budget, and handy DIY-ers can build a fantastic home theater without spending too much. The Ultimate Outdoor Home Theater – If money is not a factor, you can transform your whole backyard into a Cineplex-quality home theater like this family from Michigan. Avid University of Michigan football fans, they designed their home theater to take advantage of the beautiful fall weather before the cold Michigan winter sets in. The screen is built into a weatherproof shelter with a sliding door, and the sound system is only built into the seating areas to not disturb neighbors. Large granite tables feature built-in firepits for warmth and roasting marshmallows. Speakers are even wired throughout the house, so the game can be enjoyed from inside thanks to large picture windows. A sophisticated indoor/outdoor WiFi system helps all of the AV components talk to each other, and allows the system to be controlled from an iPad. Total cost - $55,000. California Drive-in – This modern Hollywood Hills home by Belzberg Architects transforms the side of the guest house into a giant movie screen. This setup can be enjoyed from the driveway or the upper deck of the main house. It has a definite drive-in theater feel that would make for a fantastic movie night. Do It Yourself – If you don’t have a Hollywood-size budget for your home theater, don’t despair. 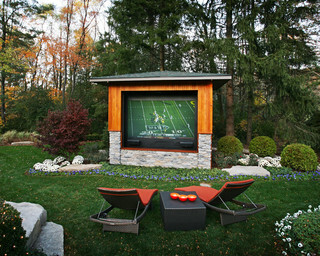 Any backyard can be made into a home theater with the right equipment and skill. About.com has some terrific ideas to get you started. Portable screens are available including inflatable models, or a screen can be made from a white wall or ironed bed sheets. A laptop and projector makes a great AV system, and can be had for a reasonable price. Many good projectors are less than $500 these days. Outdoor speakers can be wired to your patio, or you can opt for wireless speakers that work with Bluetooth. Many of these systems can be taken down and stored when the weather turns bad.